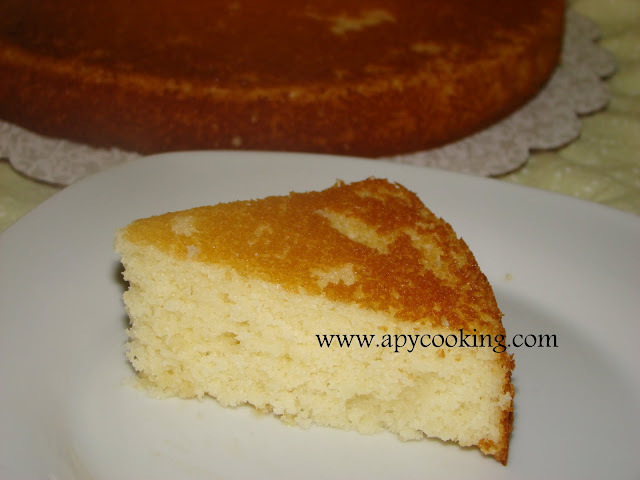 Here is a recipe for a basic (two-layer) yellow cake. I was happy with the texture of the cake - it was soft and moist, so I thought of sharing it with you all. You can choose to serve the cake as it is, or frost it with your favourite icing. 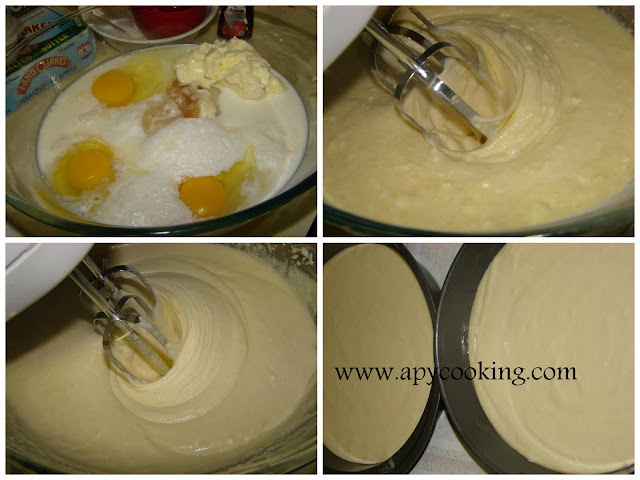 This is Betty Crocker's Starlight Yellow Cake recipe and is very easy to execute - just dump all the ingredients in a (very) large bowl, beat the heck out of them and you have your cake batter. I made one minor change - the original recipe called for 1 tsp of salt which I found a little too much. Go ahead and add 1 tsp salt if you like saltiness in your cake. However, if you are planning to frost your cake, you may not want to add too much salt. Grease the insides of two 9" round pans liberally with oil or cooking spray. [Or line with parchment paper]. In a large bowl, pour all the ingredients. [Pour the dry ingredients first so that they are at the bottom of the bowl, otherwise they will fly all over when beating]. With a handheld electric mixer beat on low speed for 30 seconds. Increase the speed to high and beat for 3 minutes. Make sure you keep scraping the sides with a spatula as you beat, so that all the ingredients are mixed well and lumps are not formed. Pour the cake batter equally into the two pans. Bake for 25 to 30 minutes or until fork inserted in the center comes out clean. [Mine took 25 minutes]. Remove from the oven and allow to cool on a wire rack for 20 to 30 mts. Invert the cake onto a cake board. Frost if desired. [I used flour frosting]. Refrigerate before frosting so that the crumbs don't show up. 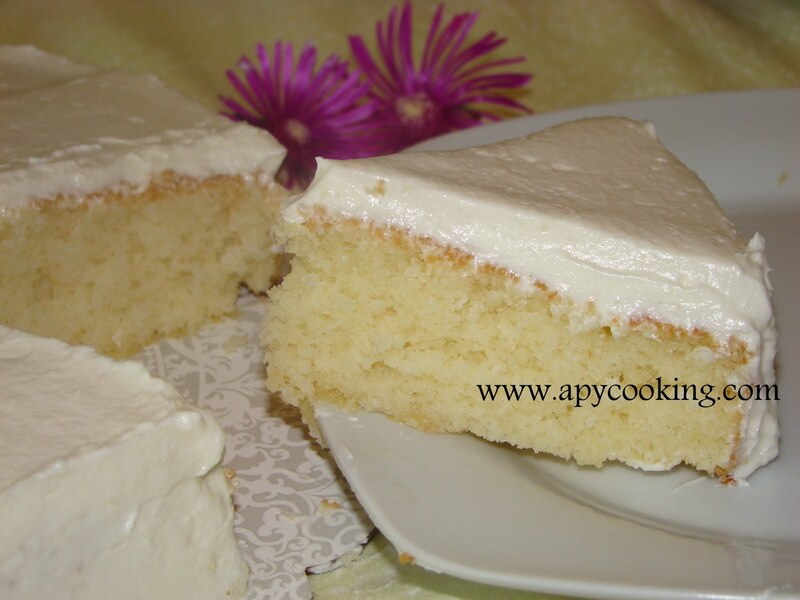 Refrigerate after frosting so that it sets well on the cake. I just love the texture of the cake..looks so moist, perfect and delicious..
What a good classic cake. Thanks for sharing your recipe! Very soft and moist cake. Must have tasted simply yummy. Omg..looks awesome , spongy cake. Super soft & moist..Love this delicious cake.. I was looking for a easy and tasty recipe. Thanks. wow so moist and delicious. I baked it today and the result is so super yummy, soft and so moist. thank you so much for sharing it! !